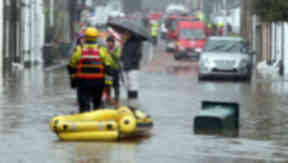 Minister said the cash will help prevent the 'utter devastation' caused by flooding. The Scottish Government is investing an additional £713,000 to help prevent the "utter devastation" that can be caused by flooding. Environment secretary Roseanna Cunningham announced the funding boost ahead of Scotland's annual flood management risk conference in Glasgow. The cash includes £300,000 for the Scottish Environment Protection Agency (Sepa) this year to help with its work on flood forecasting and warning - with the same organisation getting an additional £200,000 in 2019-20. The Scottish Flood Forum will receive £33,000 next year for its efforts to raise awareness of the importance of flood protection work for properties. A further £180,000 will go on surveys aimed at providing better data to improve the assessment and management of flooding risks. Ms Cunningham said: "Flooding can cause utter devastation to communities, as we saw in 2015. It's vital that we do everything we can to prepare for the worst, and this additional funding will improve our resilience against future flooding. "It will allow us to increase our understanding of when and where flooding is most likely to occur, and to support those communities affected. "The Scottish Government is spending £420m over ten years to protect homes and businesses in our most flood-prone areas - demonstrating our commitment to tackling this age-old problem. "Ensuring our communities, society, economy and environment are protected from the impacts of climate change is a crucial step to delivering a greener, fairer and more prosperous country."